This old sketch was done entirely with the mouse, and it doesn’t get any bigger than this. 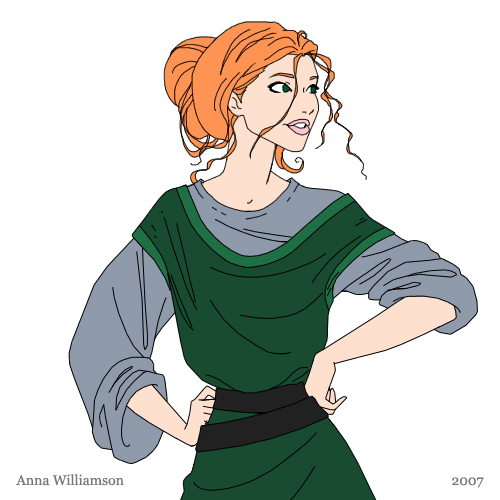 I think I did it to test the fairy tale princess in a tunic and surcoat look, for her “fish out of water” moments. I love that the green surcoat matches her eyes. SWEEEET! She looks GREAT in GREEN!!! Have we seen her for Christmas in her green gown yet? I know she has a gorgeous green gown, I was just wondering if she’ll be wearing it this Christmas. Keep up the FANTASTIC work!!! You are a genius!